On Tuesday Feb. 13 from 8-9:30 p.m., Hillel Waterloo hosted an event called Pack with Purpose, located in Bricker Academic building on Wilfrid Laurier University’s Waterloo campus. The event was for both Jewish and non-Jewish students from both Laurier and University of Waterloo. In partnership with OneRoof Youth Services in Kitchener, the event involved guided discussions surrounding homelessness as well as packing emergency kits for people experiencing homelessness within the community. The event was hosted by Aaron Subel, first-year representative of Hillel Waterloo with assistance from Emily Goldstein, director of Hillel Waterloo. The initial discussion focused on the ideals of various Jewish texts which examined philosophies surrounding giving, generosity, humility as well as the merit of charity. 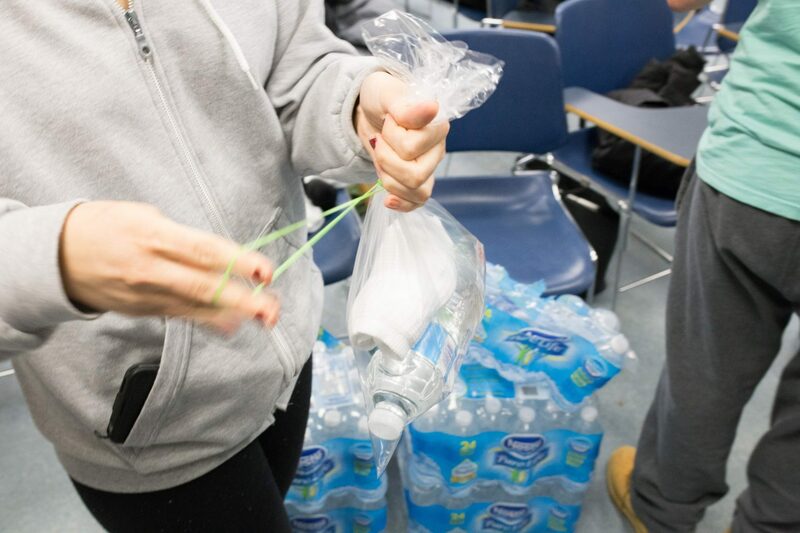 This particular event was called Pack with Purpose, as individuals created emergency kits and planned to send them to OneRoof Youth services in Kitchener where they will be distributed out to the those experiencing homelessness. “Hillel is a club which aims to enhance Jewish life on campus. We have Friday night dinners for Shabbat, social events and ‘lunch and learns’ where we have lunch and learn about Jewish topics together,” Subel said. The packing consisted of setting up the various supplies in an assembly line fashion with bags that were filled with a fresh pair of socks, lip balm, snacks, band-aids and other necessities. “This is one of our first social justice events we’ve had this year and I really thought that this is something that could really help us, so I thought, why not make a social justice event,” Subel said. Goldstein provided some insight on Hillel’s name and why it is so important that Hillel continues to plan and host these social justice oriented events. “Hillel, the elder, is a Jewish wise person and the famous quote by him is ‘If I am not for myself, who is for me? And when I am for myself, what am I? And if not now, when?’” Goldstein said. Goldstein also touched on the importance of implementing the Jewish faith within their activities because of the strong foundation of charity and giving that the religion provides insight to. Goldstein also explained how activities like packing emergency kits puts perspective on how we should remain humble enough to give back to the community. Nearing the end of the evening, over 100 emergency kits had been made for OneRoof Youth Kitchener. “At university, after my first semester here, I realized that everyone is really busy with their work and with their lives,” Subel said. “Trying to get through university, we don’t really have time to give back to someone else or other people,” he said. “So, I thought to make an event that gets people together that helps the other members and homelessness in the community. Won derful thinking and time management to be able to give of oneself! Well done and so proud of our wonderful grandson!